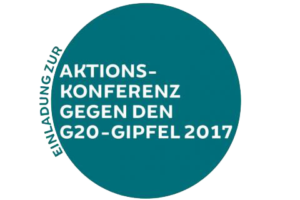 On the 3./4.12.2016 there will be a first Action-Conference against the G20-Summit 2017 in Hamburg. On the 7th and 8th of July 2017 the G20 summit is supposed to take place in Hamburg. The heads of the governments of the 19 richest and most powerful states of the world, accompanied by 6.000 delegation members, surrounded and permanently photographed by 3.000 journalists and of course cordoned off and protected by an army of at least 10.000 police and secret service operatives. All this is supposed to take place in the middle of Hamburg: in the exhibition halls, in the town hall, in the Elbphilharmonie. Large-scale and multilevel barriers, ID controls, evacuated appartments – the main victims will be the people in the Karoviertel and the surrounding neighborhoods. Especially those, that are already more exposed to frequent controls and harrassments because of the color of their skin, their legal status, their precarious social situation or other reasons. The residents are supposed to give way for an orchestration of power, a living city is turned into a dead scenery. The main performance is the illusion that the political elites of global capitalism have everything well under control, that they are somehow capable of providing security, peace, livelihood and a real future perspective to the people of the world. But we are witnessing the exact opposite: the prevailing world order is a further escalating world disorder of brutal social inequality, structurally embedded sexism and racism, ecological destruction and spreading wars. Millions of people are forced to flee, billions are struggling to survive and the number of people that is affected by precarisation is continuously rising, also here in Germany. At the same time a small global upper class is getting richer and richer. The political representatives of this world disorder want to come to Hamburg: Erdogan from Turkey, Putin from Russia, the cold putschist Temer from Brasil, and if we are unlucky also Donald Trump. There also aren’t a lot of good things to say about the governments of China or India. And the so very democratic governments of western Europe? They are the ones that build walls and fences and coldly let fleeing people drown at sea. We will show them that they are not welcome in Hamburg! In many political groups and spectres the reflections on how to organize the necessary protests and actions against the G20 Summit have already begun. There are many different approaches: Some care about the right to the city, others about climate policy, to others flight and migration or capitalism as a whole matters. There are ideas such as a counter summit, a major demonstration, or disobedient actions around the conference venue or in the whole city. No matter what the criticism of the G20 Summit is precisely based on, no matter what actions or forms of expression are prefered, the protest can only be a success if we are able to make the possibility of a different world, a world of justice and solidarity, appear in them. And if the protest are complementary rather than in opposition to each other. That needs arrangements and a lot of communication between the summits opponents. Come to Hamburg on the 3./4.12. and bring your ideas and questions! Then the pictures that will go around the world in July 2017 will be completely different to those the summit strategists wish for.